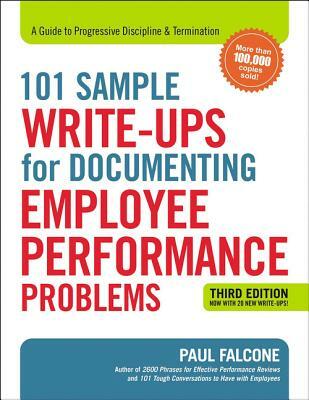 Over 100,000 copies sold Now with 20 all-new write-ups Managers may dread dealing with performance problems, but this sanity-saving guide by HR expert Paul Falcone is here to help. Revised to reflect the latest developments in employment law, the third edition of 101 Sample Write-Ups for Documenting Employee Performance Problems explains the disciplinary process and provides ready-to-use documents that eliminate the stress and second-guessing about what to do and say. These expertly crafted, easily customizable write-ups address: Absenteeism * Insubordination * Sexual harassment * Drug or alcohol abuse * Substandard work * Email and phone misuse * Teamwork issues * Managerial misconduct * Confidentiality breaches * Social media abuse * And more With a focus on getting employees back on track, each sample document includes an incident description, a performance improvement plan, outcomes and consequences, and a section for employee rebuttal. Whether you're addressing an initial infraction or handling termination-worthy transgressions, this trusted resource ensures every encounter remains clear, fair, and-most importantly-legal. Paul Falcone is an HR executive who has held senior-level positions with Paramount Pictures, Nickelodeon, and Time Warner. A long-time contributor to HR Magazine, he is the author of bestselling management books including 2600 Phrases for Effective Performance Reviews.